Now that winter is here, it’s time to bundle up and sharpen those ice skates and head to a local ice skating rink. Whether you prefer a more urban setting like the ice rink at Brenton Skating Plaza or something off the beaten path like a park pond, the Des Moines area offers plenty of options for beginner and experienced skaters alike — there’s even several FREE skate spots. And if it ever gets too cold to glide outside, you can always hit the indoor skating rink. Be sure to visit our Winter Fun Guide and Sledding Spots around Des Moines for even more wintery family fun. Unless otherwise noted, the official outdoor ice skating season is November through early March. Visit websites and social media sites for holiday and extended hours, and weather-related closures. The community ice rink will be ready for skaters once the temperatures have dropped low enough for it to freeze. The ice rink is FREE and open to the public. Skaters must provide their own ice skates. Hockey skating hours are dawn to noon and open skating hours are noon to dusk. Admission: Monday through Thursday – Adults $8.50; Youth (age 6-12) & Seniors $5.25; Children 5 and under are always FREE; Skate Rental $4.75; Skate Aids $5.00. During the winter, Des Moines Parks and Recreation clears frozen ponds for ice skating at three neighborhood pond locations. When these facilities are open for skating, it is unsupervised and available FREE of charge during normal park hours – sunrise to sunset. BYOS – Bring Your Own Skates. Des Moines Parks posts if the facilities are open, or not, on their social media outlets and uses a flag system to indicate availability of public skating for the three ponds. During winter months, the ice will be open for hockey from dawn to noon, and open skating hours are from noon to dusk. The rink is open when weather permits – a green sign will be posted at the gate to indicate that the rink is open; a red sign will be posted when the rink is closed. Bring your skates and take part in this new activity in Indianola. The community ice rink is located in the southeast corner of Centennial park and will be ready for skaters once the temperatures have dropped low enough for it to freeze. The ice rink is FREE and open to the public. Skaters must provide their own ice skates. Hockey skating hours are dawn to noon and open skating hours are noon to dusk. A green sign will be posted at the gate to indicate when the rink is open; a red sign will be posted when the rink is closed. Metro Ice Sports Facility is a tried-and-true arena open year-round for big (and little) wobbly Des Moines legs. They primarily offer public skate on Fridays and Saturdays. Be sure to check their schedule for times. Skate rentals are available for both kids and adults. The Facility is a happening place with hockey leagues and games, learn to skate lessons and birthday parties. 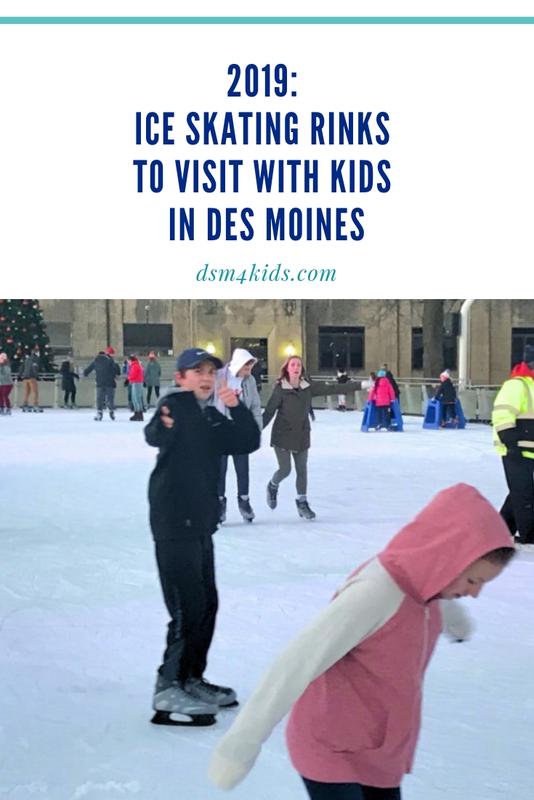 Tell us about your favorite place to ice skate in Des Moines in the comments!